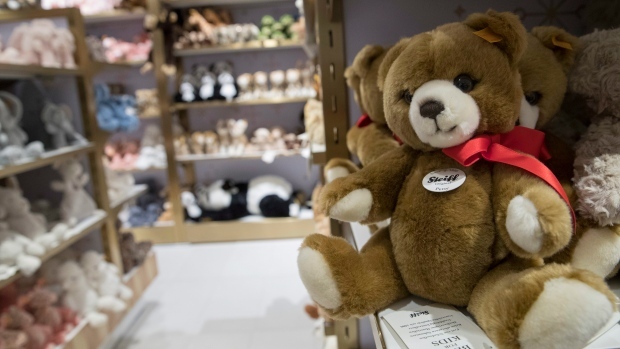 NEW YORK -- Three years after it closed its beloved toy store on Fifth Avenue, FAO Schwarz is making a return to New York. The 20-foot-long instrument with 60 keys is reflected on the ceiling for people in the plaza below to see. Replicas for sale cost US$128. There is also a toy grocery store where children can shop among artificial produce, complete with small carts, a checkout counter and kitchen supplies. For US$75, another interactive station allows kids to adopt baby dolls, while a "nurse" gives lessons on how to care for them. Live magic shows will be staged nearby, next to a spot for assembling custom remote-control cars. A 27-foot-tall rocket ship teems with stuffed bear astronauts. FAO was founded in 1862 by German immigrant Frederick August Otto Schwarz, specializing in high-end toys, some imported from Europe. By the 20th century, in stores across the country, fancy items included a US$1,500 jeweled Etch-A-Sketch and a Barbie-themed, hot pink foosball table for US$25,000. "We have beautiful artisan pieces here, like rocking horses, but we also have items that are US$10," Niggli said. "There's always going to be some of those over-the-top items. I think that's part of what you come to FAO to see. It's part of the magic." The most luxurious item on sale could be a child-size, drivable Mercedes Benz encrusted with 44,000 Swarovski crystals. Base price: US$25,000.